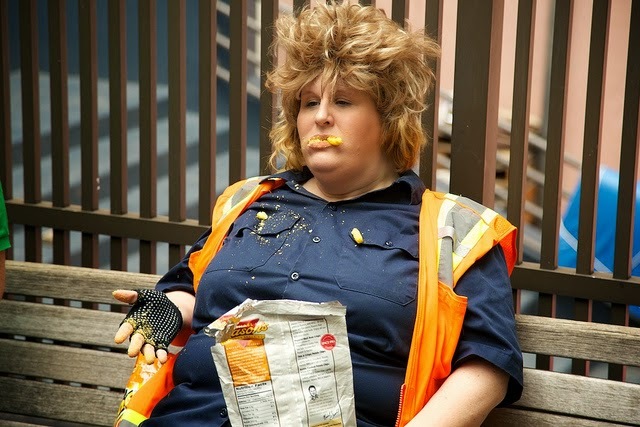 Andrea Alton's crazy, Cheetos- and lady-loving creation, Molly "Equality" Dykeman, is back with a new apocalyptic variety show, "Molly's North Korea Armageddon Family Hour." I spoke with Andrea about this new adventure, and even got a word or two from Molly. It's great to see Molly coming back in a variety show format. What made you decide to create this show? I’ve been working on new material for a while so when Stephen Michael Rondel (co-owner of The Celebration of Whimsy) said he had some nights free, I jumped at the opportunity. How do you find the variety show acts? When I see shows, especially comedy shows, I’m always on the lookout for talented people who may be a good fit for a Molly show. I always try to book people that I would want to see onstage. In this case, I already knew each of the performers. I’ve been in New York for 16 years and the downside to that is, I always seem to be rent poor but the upside is I know a lot of extremely talented people. Who will we see at next week’s show? One of my favorite people, Michael Musto will be there. He’s smart and funny, I love being on-stage with him. He always makes the show more interesting. Jubilee Diamond will be performing; she’s an amazing burlesque performer. Other performers include the twisted and funny Dandy Dark, comic genius Mary Dimino, multi-talented actor/musician Diana Oh and one of the funniest people I know comic/actor Allen Warnock. How did you come up with the end-of-the-world theme? I LOVE reading dystopia novels and watching end of the world movies. I’ve been like that since I was little. I started thinking about Molly’s take on the end of the world and some funny material started to emerge. If Aliens invaded or the Zombie Apocalypse hit, I would probably last three days but Molly is so resilient and she’s high all the time so she probably wouldn’t notice that anything bad had happened. In short, she’d probably live forever as long as she had the proper meds and was living at a Cheetos factory. And how about the name of the show? It's great, especially given the recent Sony hacking. I wish I could take credit for the name because it’s awesome but my friend and comedy writer Hy Bender came up with it. I just knew I wanted Armageddon in the title. And here is a question for Molly herself. In a cage match between you and Kim Jung Un, who would win? Molly: Byne, thanks for finally asking me a question. I would definitely win; Kim Jung Un wouldn’t stand a chance. I’m a lover of ladies and in my spare time I’m a kung fu action figure. I would probably fall asleep during the match, Kim Jung Un would think I was dead, and at some point I would wake up abruptly and kick him in the head thus causing a massive brain hemorrhage. I would then find his wife, carry her to his waiting jet and we would move to Brooklyn where we would live happily ever after. 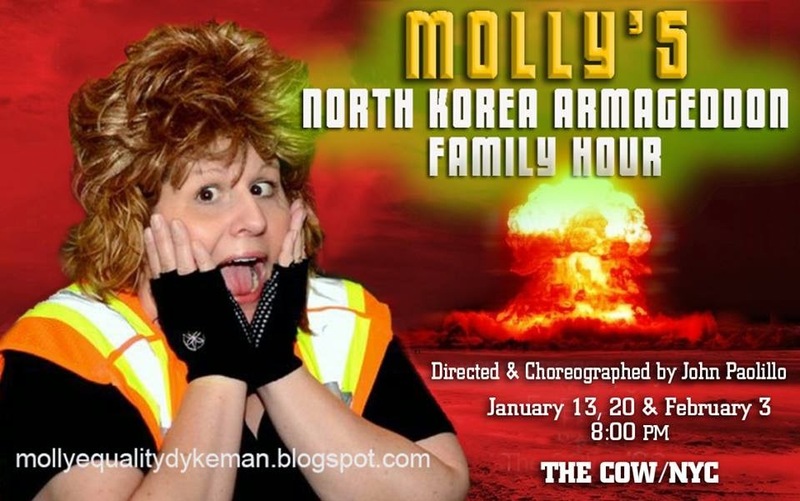 The next (and last) performance of "Molly's North Korean Armageddon Family Hour" will be Tuesday, February 3rd at The COW (21 Clinton Street). And while I don't always give restaurant recommendations, consider checking out Rizzo's, one of my favorite pizza places, or Prosperity Dumpling, for tasty, cheap dumplings, while you're there.